Every southern farm had a garden to provide fresh vegetables for the table. 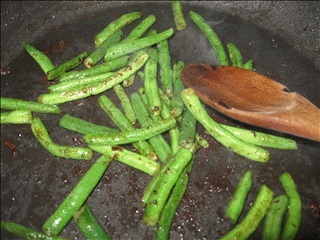 One of the common vegetables was string beans, usually pole beans like Kentucky Wonder beans. 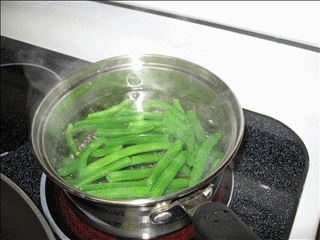 My father-in-law remembers his mother making fried green beans for supper and has a fondness for the taste. 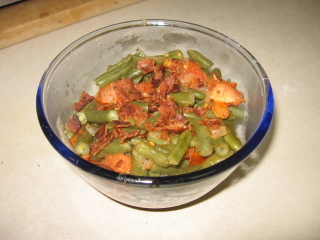 A southern tradition, fried green beans make a tasty side dish with lots of bacon flavor. 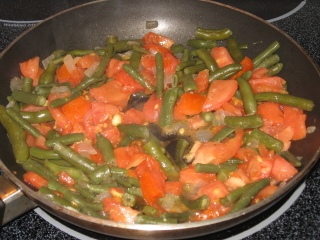 I have prepared this dish with tomatoes but they are optional and can be omitted if you prefer. Snap ends of green beans and pull any string. Very young beans will have little string. Cut to desired length. Heat a saucepan, with enough water to cover the beans, to a rolling boil. Add the beans and return the water to a boil. Reduce heat and lightly boil for 5 minutes. 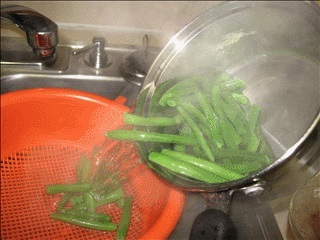 Drain the hot water from the beans and quench them with cold or iced water. Set aside. Dice tomatoes. Discard seeds and membranes. Set aside. If onion is desired, cut across onion slice and break into curved segments. Add to reserved beans. Crisp fry bacon and set on paper towels to cool. Pour off all the drippings just leaving the brown bits and a coating of bacon fat.